Todays trip to the post office went much better than yesterdays mangled, destroyed mail. I received a trade package from Behind These Hazel Eyes a.k.a. Lonestarr, a.k.a. @TwitchySensei. The package contained a bunch of Cano, Pujols, Russ Martin, and a Lind or two. 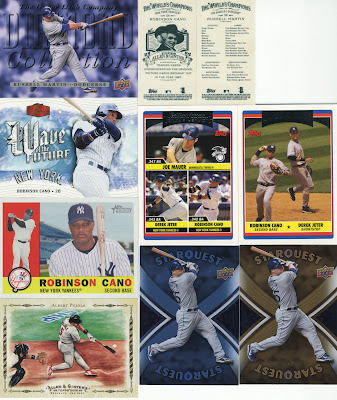 I scanned some of the cards from that bunch in this picture. The next card is super sweet because it is from the Ticket to Stardom set, and serial numbered 065/110. 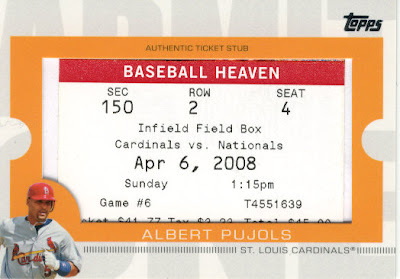 This is my first and only Pujols ticket stub from this set, and it came all the way from baseball heaven, at least that's what the ticket says. The last two cards I'm going to show were totally unexpected, and probably my favorite. They aren't even baseball cards. They are WWE cards of John Cena. I like these cards for several reasons, one of which is that Lonestarr actually pays attention to things I sputter on Twitter. Most women think men never listen to a word they say, however this disproves that theory. Another reason I like them is because I haven't owned a wrestling card since somewhere around 1989 or 1988 when the "WWF" cards looked like little tv screens and George the Animal Steele was on them. Last reason I like them: John Cena is hot. Go check out his blog and see the ridiculous card he pulled from a retail pack. Aha, so this is where a bunch of my hits came from yesterday. Glad you liked the cards. No way could I let the potential lulz of sending the John Cena cards get away. And I have one more to send along when I send your sketch card.